As you would expect for a golf course named the Little Falls Golf Club, this course features picturesque views of a beautiful little waterfall (best observed from the 7th tee). 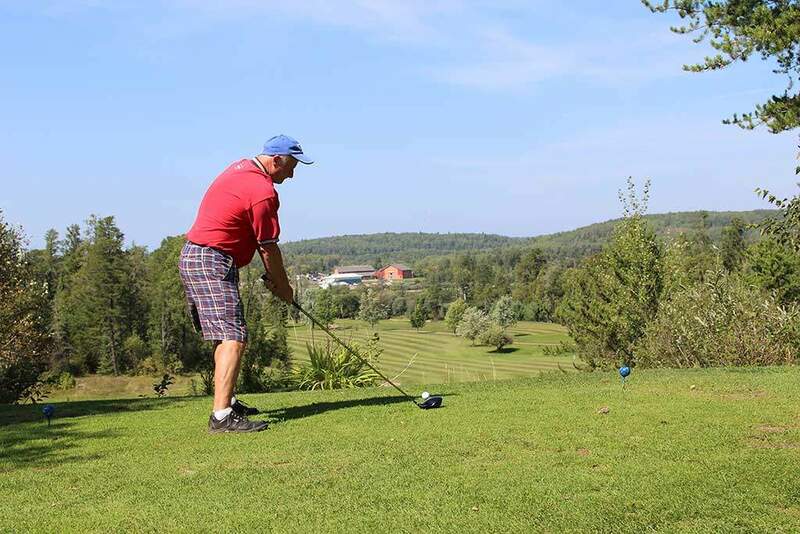 And, just as you would expect for a golf course nestled away in the Wilderness of Northwestern Ontario, this course has a tight playing layout with narrow fairways scenically framed by dense trees. The terrain here is quite hilly and golfers are frequently presented with uphill or downhill lies. Additional difficulty is caused by a creek that winds its way through the course and will force you to lay-up or carry it several times in your round. The biggest obstacle at Little Falls, however, is the narrowness of its fairways, and a failure to keep your ball in the playing area will quickly add strokes to your score. Stray just a few yards from the fairway and the thick brush of Little Falls’ rough will make your recovery shot extremely difficult. Compensating somewhat for this course hazard is the quality of Little Falls’ greens – reputed by some to be among the finest in North-western Ontario. Small in size, these well kept greens possess pronounced slopes that deliver interesting breaks. They do, however, tend to putt true, so if you’ve read your line correctly and you have the pace right, you can usually count on the ball dropping. Little Falls Golf Course welcomes all to play on the beautiful and challenging greens. In addition, it offers tournament bookings for all golf tournaments. For more information or to book a tee time call the Proshop at (807) 597-6638 or email.